Every few years, the Federal Government of Nigeria changes the policy of obtaining yellow fever certificates in the country. In the last six years, I’ve owned two yellow card certificates and I am about to get the third one. Two cards in six years don’t seem like that many but when you consider that these cards should last a minimum of 10 years, you realize that it is one too many. I remember when I got my first card – you know, we always remember our firsts. She was so young and full of sunshine and hope; excited to see the world, excited to experience the menace of Nigerian immigration officers and the condescension of immigration officers abroad. Sadly, she never got to experience any of these things. Barely two weeks after I had her, the Government had not only declared that she was invalid but had also declared that the vaccines could no longer be given in private hospitals. I had to get another one. That short fan fiction brings us back to the reason for this post. 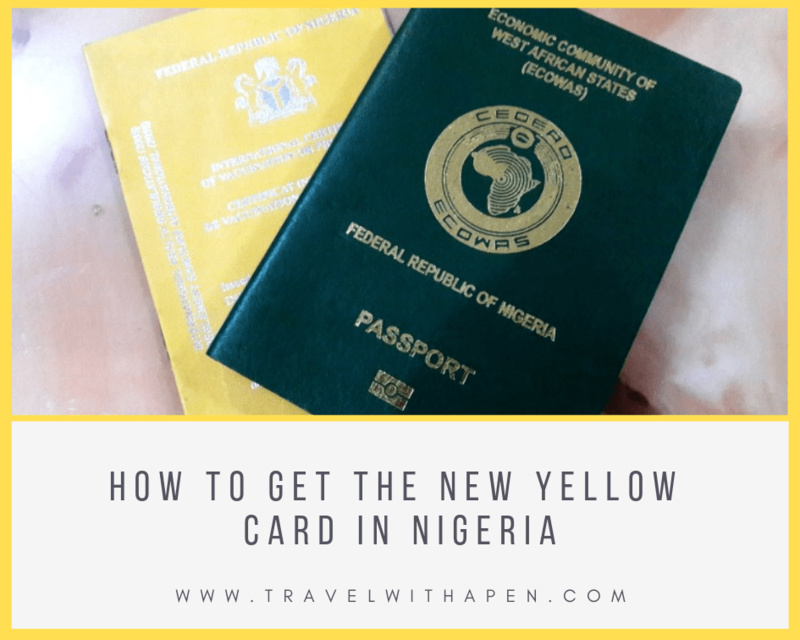 It’s 2019 and Nigerian travellers are required to get a new (e)yellow card. But before I get into details of the process of obtaining one, I’ll like to elaborate more on this card and its importance. What Exactly is a Yellow Card and Why is it Important? Yellow (fever) cards or certificates are needed to show proof that you have received a vaccination against the disease. 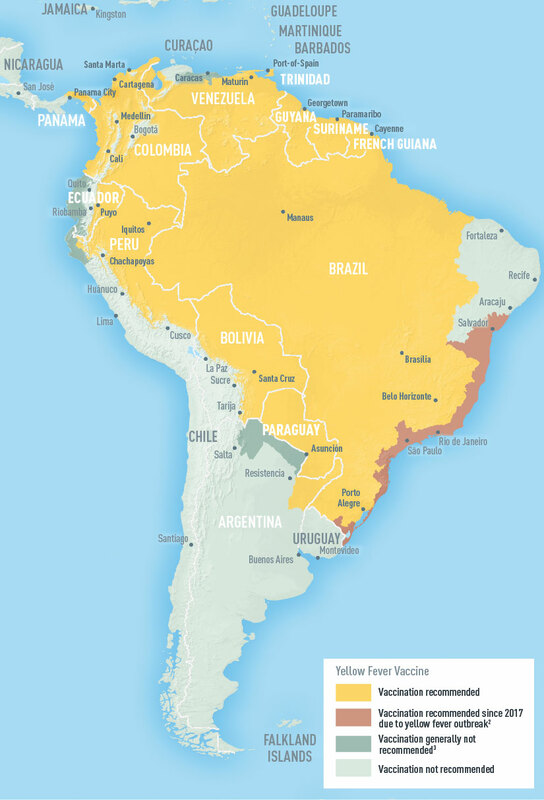 The vaccines are administered in order to prevent an outbreak and to protect travelers that may be exposed to infection in areas where the disease is prevalent. 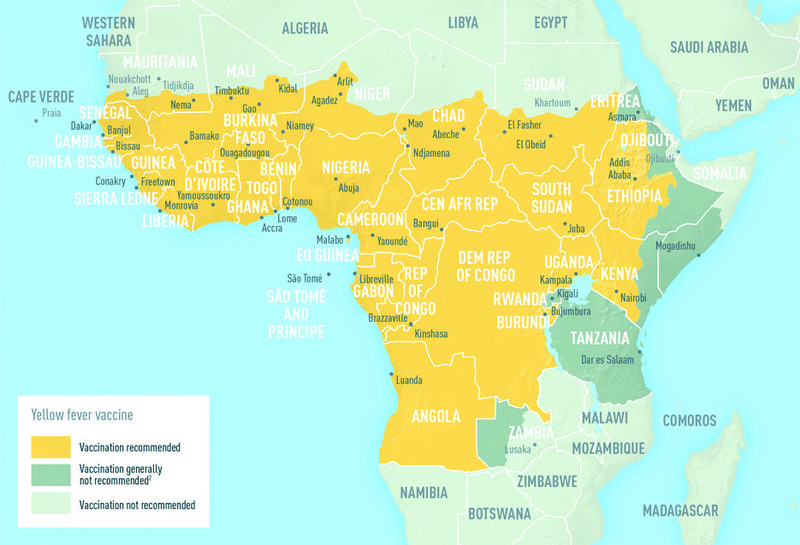 AFRICA – Angola, Benin, Burkina Faso, Burundi, Cameroon, Central African Republic, Chad, Republic of the Congo, Democratic Republic of the Congo, Côte d’Ivoire, Equatorial Guinea, Ethiopia, Gabon, Gambia, Ghana, Guinea, Guinea-Bissau, Kenya, Liberia, Mali, Mauritania, Niger, Nigeria, Senegal, Sierra Leone, South Sudan, Sudan, Togo, Uganda. There is no treatment or cure for the disease at this time. However, you can prevent infection by preventing against mosquito bites and getting vaccinated. A vaccine will be administered after your payment has been confirmed. As for the question of whether you need to take the vaccine again, I don’t think you would have to. When I went to get my second yellow card, I mentioned that I had already been vaccinated, so I wasn’t given another one. I just paid for the card. As a rule, my yellow card accompanies my international passport everywhere it goes to. That being said, there are some countries who don’t need proof of vaccination. You can find a list of countries who do here. From April 1st, 2019, all old yellow cards will become invalid. Personally, I think this would be a source of ruckus and more extortion, especially at the land borders. I can imagine the officials telling you that there is a different charge for ‘new entries.’ It would be a miracle if travels went smoothly after this change. I’d like to hear your thoughts… Have you travelled recently with the new yellow card? Was it easy getting and traveling with one? Thanks Amarachi for this one, we found it useful as we are preparing for our vacation. Question now is my wife is few weeks pregnant and it is not advisable to take a yellow fever vaccine during pregnancy. I was wondering if you know what we can do. She’d be 3 months pregnant by our travel time. My wife got one last weekend. She informed the guys at the port health authority that she was pregnant. They stamped on the yellow card that she was exempted from vaccinaton due to pregnancy. Amarachi, thanks for this powerful information. I so much appreciate. Hello, quick one. In the case of a visiting expatriate on business for just 3days or less, would he also need the e-yellow card? 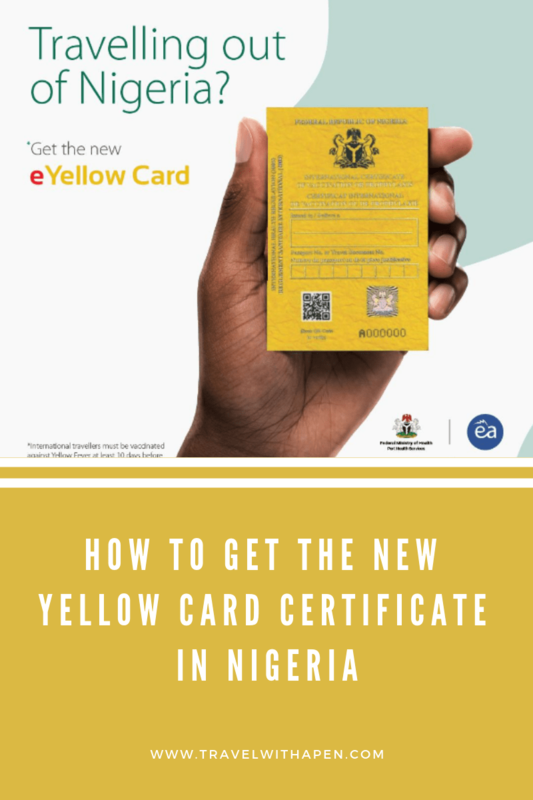 Hi, these particular (e-yellow) cards are gotten in Nigeria. They don’t apply to other countries but an expatriate would definitely need a yellow card (gotten from the country he’s coming in from) – regardless of the duration of the visit. Many thanks for your great post. It’s really an eye opener. I just registered for the ‘e-yellowcard’ on the website (www.yellowcard.com). I was routed to the remita webpage where I made the payment online successfully (using pay with card option). Thereafter, I printed out my registration details from the yellow card website. To my utter surprise, the registration details bore the names of a totally different person, instead of my names. Meanwhile my Remita receipt bears my name and the same Remita Reference ID, which has now been used to register someone else. I wish I could upload the registration details and Remita Receipts, so you could see for yourself. It’s all so strange, more so, I went over my personal details meticulously to avoid any errors. Unfortunately, there’s no contact detail indicated on the yellow card website. I wonder how I could go about correcting this error from the website. Any thoughts/Advice would be highly appreciated. Wow, this sounds very strange. It’s most likely a system glitch and I’d have suggested refreshing or using the ‘Get User Detail’ button to see if your correct details come up. If that fails, it may be better to just head on to the Port Health office with your payment ID. They should be able to sort things out there. Please let’s know how it goes and how you’re able to resolve it. Hi Amarachi, please when you say Port Health office, you mean Airport right in this case. By the way, I am going to the EU and it is not required to get it but I plan to get it so I do not get surprised at the airport. Hi Chukwuma, there is a Port Health office close to the international airport – That’s where I’m referring to. I think it’s a good idea to just have it as well. Better to have it and not need it than to need it and not have it. The thoroughness with which you do your research and give us information ! I giving you ten thousand hugs. I think this yellowcard thing is just a money making machine biko. I also have two yellowcards…likewise none has reached its promised useful life of ten years. I also don’t see the ‘e’ part of this card. I’m guessing they have called it so because of the online registration and hopefully, the QR code has some use too. Hi Victoria, you can check the Federal Sec Complex, Ibadan. I got this from the Ministry of Health’s website. You’ll need to confirm though. Thank you for the update on the Yellow Card. As always, your write-up was so comprehensive and insightful to say the least. May you never lack the strength and resources to continue the excellent jobs you’re doing with your posts. Also, I pray and hope that you receive more than the venerations and rewards that you deserve.